The Prime Minister has recently signed a decision to add the Loc Ninh solar power project in Binh Phuoc Province to the plan to develop national power generation with capacity of 800 MWp. This is the foundation for the province to promote attraction of investments into projects that play the key role in local socio-economic development. Since the end of last year, Hung Hai Company has begun construction of the power grid and the Loc Ninh – Binh Long 2 220KV electrical substation to connect solar electricity plants in Loc Ninh District to the national power grid with total length of power lines of nearly 30 kilometers, running through five communes of Loc Ninh District with total investment of more than VND1.2 trillion. This is an urgent item for transmitting and connecting to national power grid when solar power plants are put in use. Currently, Hung Hai Company and other investors are speeding up construction progress of the project. According to Mr. Nguyen Trung Hieu, deputy director of Hung Hai Company, his company and other investors have invested more than VND7 trillion into the solar power project in the border district of Loc Ninh with three stages of investment. They have been speeding up completion of legal procedure in order to start construction. The project is expected to contribute to state budget around VND800 billion annually, and provide jobs to around 1,000 local laborers once it comes into operation. Binh Phuoc Province has high potential for solar electricity, especially at Loc Ninh District where the intensity of the solar radiation is higher than other places in the regions at 5.14 KWh per square meter per day so it is suitable for developing renewable energy. According to the plan to develop solar power to 2030, Binh Phuoc Province is expected to generate 4,775 MWp. Total area planned for developing solar power plants is about 5,000 hectares, located in Loc Ninh District. The province is calling for potential investors to survey and preparing supplementary documents for each project in the province. Up to now, the PM has approved six solar power projects with total capacity of 850MWp for Binh Phuoc Province and another 30 solar power projects with total capacity of 2,255 MWp are being assessed by the Ministry of Industry and Trade before presenting for the PM’s approval. 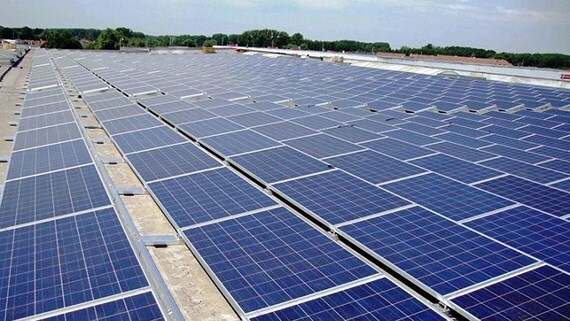 Mr. Nguyen Anh Hoang, director of the Department of Industry and Trade of Binh Phuoc Province, said that with the current progress of the two approved solar power projects, around first 600 MWp of solar energy will be completed to connect to national power grid and start commercial operation by June this year. The current largest difficult is that investing in solar power is costly, it requires investors to be financially healthy. Investment progress registered by most investors mostly falls on the period of 2018 and 2019, so they are under great time pressure and policy of power buying price. Many projects have not implemented investment timely yet. In addition, connection and transmission lines in Loc Ninh District have not met the requirements for power transmission.